VANCOUVER -- A dismal return for steelhead salmon in British Columbia's Interior Fraser River system has prompted an emergency assessment of the species. Eric Taylor, chair of Committee on the Status of Endangered Wildlife in Canada, said two recent requests from the public for an investigation into the species in addition to mounting evidence of the steelhead decline led to last week's decision to take action. "A lot of us are aware of the problems of the severe reduction in abundance that's been observed," he said. Alan Sinclair, a marine fisheries expert on the committee, said average annual returns of the fish should be in the range of 1,000 to 2,000. But the Steelhead Society of B.C. said only about 200 steelhead returned this year to the Thompson River and fewer than 50 came back to the Chilcotin River. The exact cause of the decline is unclear. Sinclair said warming river temperatures and changing ocean conditions have contributed added stress to steelhead and other salmon populations. Taylor said steelhead have been on the committee's radar for several years as data collected by the province has shown a steady decline. "This year was one more data point in a time series of decline," he said. "There is always hope the next year will be a little bit better but because of the weight of the evidence over the last couple of decades, we just decided well maybe we should expedite the process." An emergency assessment of the two watersheds will take place in early January over a two-week period. It's a faster process than a full study that typically takes two years to reach a conclusion. The Steelhead Society of B.C. is applauding the assessment. "I have mixed emotions about this news" said president Brian Braidwood in a statement Wednesday. "On one hand I'm thankful that the scientific community recognizes the importance of Interior Fraser steelhead; on the other I'm saddened that these great fish are in danger of extinction." Depending on the results, Taylor said it could lead to steelhead being listed as an endangered species by the federal government. The findings would first be delivered to the federal Ministry of Environment, Taylor said. The ministry then has 90 days to respond with a decision or to launch a further review. Taylor said there is no deadline for the government to decide whether or not to list a species as at risk once it's responded to the assessment. "Some species have languished for years where a listing decision by the federal government hasn't taken place despite the fact (the committee) made a recommendation years before," he said, adding the government has committed to making decisions within three years for commercially exploited species. An emergency review was last launched for three species of bats in 2012, Taylor said. All three were listed as endangered under the Species At Risk Act in 2014. 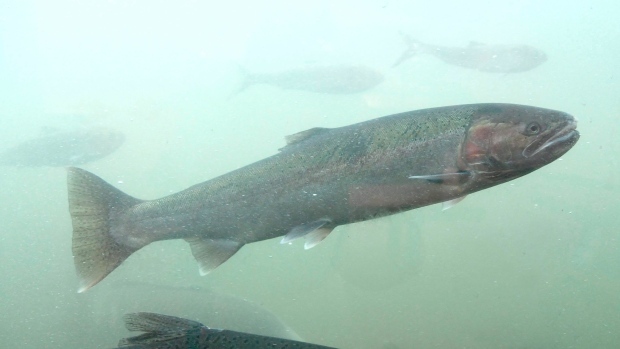 While steelhead have long appeared to be in decline, Sinclair said salmon and other fish populations have at times shown promise of bouncing back. "I think if the appropriate management actions are taken there is hope for recovery," he said.